Malaysia Airlines flight MH17 was downed in eastern Ukraine on July 17 last year, killing all 283 passengers and 15 crew members. Both Kiev and the eastern Ukrainian rebels placed the blame for the disaster on each other. Kiev also claimed there were no Ukrainian jets or anti-aircraft systems in the proximity of the crash. When it came to providing evidence, however, the narratives were not so easy to back up. At the end of July, Russia’s Defense Ministry released military monitoring data showing Kiev military jets tracking the MH17 plane shortly before the crash. 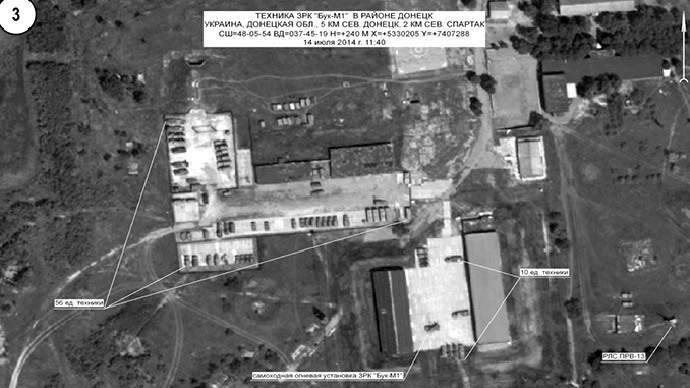 The ministry also posted satellite images of nearby areas where Kiev had had its air defense units deployed. On the day of the crash “Ukrainian military had three or four air defense battalions equipped with Buk-M1 SAM systems deployed in the vicinity of Donetsk,” Russian Armed Forces Lieutenant General Andrey Kartopolov said, describing the intelligence gathered. Some Western journalists have dismissed the satellite data as “fake,” with Bellingcat going as far as conducting an“analysis” of images. But, German image forensics expert Jens Kriese said in an interview with Der Spiegel that it is, in fact, not possible to tell whether the images have been manipulated. “From the perspective of forensics, the Bellingcat approach is not very robust. The core of what they are doing is based on so-called Error Level Analysis (ELA). The method is subjective and not based entirely on science,” he told Der Spiegel. He went on to explain that ELA does not provide clear results and the conclusion is always based on the human interpretation. When asked about Belliingcat’s claim that the Russians had used Photoshop to manipulate their images of Ukrainian BUK missile launchers, Kriese was skeptical. Bellingcat’s claims were based largely on an analysis of satellite images, performed using the website FotoForensics.com. However, it appears that even the founder of that website is unconvinced of the veracity of the group’s work. Still, the UK-based Bellingcat group saw their report immediately become big news among the global media, with publications including the Daily Mail, Telegraph and Deutsche Welle reporting their claims. Not all the press was positive. In addition to criticism from experts, a well-known Russian blogger Tima aka ntv also claims to have debunked the accusations. He says he found a number of obvious mistakes in Bellingcat’s work. The blogger analyzed photos from Bellingcat’s own website and said he found the same evidence of manipulation using Photoshop as was alleged against Moscow. He then explained that the use of Adobe Photoshop CS5 software is actually standard method when downsizing images, which is the most likely reason why the Russian Defense Ministry used it. The blogger dismissed the ELA method altogether. ELA is used to look for areas within an image that have different compression levels – a sign that the image has been altered. Bellingcat claimed it had discovered five such areas. After using ELA to analyze images known to be unedited, Tima discovered a variety of different compression levels, which he said proves that this method is incoherent and cannot be trusted. The founder of Bellingcat, Eliot Higgins, aka Brown Moses, was invited on RT’s ‘In The Now’ show to comment on the report. He ignored the request and turned to sarcasm on Twitter instead. Higgins attached a Simpsons video to demonstrate how he thinks his interview on RT would have been severely edited. This is not the first time that Higgins’ work has faced severe criticism. Back in February, the Guardian was forced to correct an article co-authored by Higgins, who accused the Russian military of shooting at the Ukrainian Army from inside the Russian border. This week also saw the manufacturer of the BUK missile system, Almaz-Antey, announce that it had conducted its own investigation into the crash of Flight MH17. The Russian defense contractor concluded that if it was indeed an anti-aircraft missile that brought down Flight MH17, it would most likely have been one from the BUK-M1 system, which the company hasn’t produced since 1999. Almaz-Antey said that Russia no longer has such weapons in service. However, according to the company’s chief engineer, Makhail Malyshev, back in 2005 Ukraine still possessed almost 1,000 such missiles. The Dutch investigators have not yet finished looking into the MH17 tragedy, but several leaks to the media appear to suggest the BUK missile theory remains the most prevalent. The Ukrainian authorities and the West blame the Donetsk militias for downing the plane, saying they used a BUK surface-to-air missile provided by Russia. The accusations have been denied by the rebels, while Moscow has repeatedly cautioned against blaming anyone before the investigation into the crash is completed.